Helping your kids understand the value of money can be a difficult task, but after having your arm tugged on a million times with the broken record “Can I have that?” playing in the background whenever you visit a store, you begin to realize that teaching them about saving money is not just important — it’s a survival tactic. If you’ve been trying to figure out a way to explain to your child that money does not grow on trees, but the message is just not getting across, you might consider the following books that teach kids from the preschool level to the end of middle school about the value of money, how to count it and even how to save and grow it. Below are some of the most popular books for children who fall into the age group of three to roughly seven years old. Bunny Money by Rosemary Wells — This book was created with the preschooler to 6-year-old in mind and follows Ruby and Max as they take a fun shopping trip to buy a birthday present. After a few mishaps with money mismanagement, the pair learns a big lesson in the value of money. Hopefully your child will too! 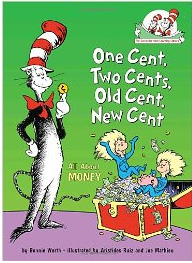 One Cent, Two Cents, Old Cent, New Cent: All About Money by Bonnie Worth — If your child loves Dr. Seuss (or maybe you do) then you two will get a kick out of this fun book featuring The Cat in the Hat, who shows that money absolutely does not grow on trees. By looking at the study of money and its history in a fun and colorful way, your child may be asking to open a savings account when you’re done with the book. Alexander, Who Used to Be Rich Last Sunday by by Judith Viorst — This book is recommended for kids age four and up, and describes the day Alexander receives a dollar from his grandparents. As Alexander’s dollar dwindles cent by cent, the story emphasizes the value of saving money instead of spending it, and also provides a basic math lesson in adding and subtracting. My First Book of Money: Counting Coins by Kumon Publishing — Trying to teach your child to count money can be a bit tedious, which is why this book offers a step-by-step approach for counting in increments. The workbook introduces the concept of money through relationships between coins and provides a practice session to help determine the value of all coins worth less than a dollar. Below are some books that your kids could benefit from if they fall into the age group of eight to about 13 years old. The Money Tree by Dave Hunt — This classic depicts a world in which a boy invents a money tree, and soon everyone in town has an unlimited supply of cash. No one bothers making goods anymore because the money trees eliminate the need to earn an income, but eventually, no one has any food. This lesson on economics is aimed at children age 10 and under. Money by Joe Cribb – This book looks at the diverse world of money through the stunning real-life photography of various forms of money like Egyptian silver, Chinese hole money, Spanish gold and siege money. Also, your child can learn how banknotes are made, where the first paper money was issued and even what a million dollars looks like. 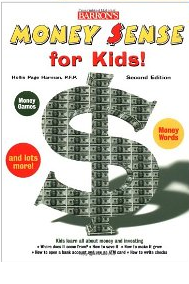 Money Sense for Kids by Hollis Page Harmon – This book offers a comprehensive guide for kids in grades four to seven to help them understand the types of U.S. currency, the history of paper and coins, how to invest in stocks and bonds and other ways to earn money. It even offers fun money games that you can take advantage of as a family. Lunch Money by Andrew Clements – This fun story follows sixth-grader Greg Kenton as he showcases his talents for making money. His latest venture, which is creating and selling miniature comic books, goes well until his nemesis, Maura, makes life difficult for him. Find out what he does to beat Maura and continue to make his money work for him. The great news is that there are plenty of resources available to help your child understand the value of money. So take time to collect a few books that could educate your child and hopefully put away the “Can I have that?” broken record you know all too well.